When Julie Andrews beloved Character Maria in the film musical Sound Of Music teaches the Von Trapp children to sing, she gently croons “let’s start at the very beginning, it’s a very good place to start.” Have you got that lovable flibbertigibbet Maria singing the cherished Do Re Mi anthem in your head? Great, you’ll need it for practicing the basic fundamentals in creating your own world famous (well maybe not so world famous, but extremely memorable) garden aria. Let’s start at the very beginning, the soil. Nothing improves your chances for gardening success than implementing and diligently practicing good soil building strategies. Add composting to your repertoire and you’ll be legendary. The three notes to remember that will have you humming in the right direction are nitrogen, carbon and organic matter or humus. Set your mind to understanding these elite three and you’ll be climbing every mountain and fording every stream until you find your garden dream! (I loved how the Reverend Mother out performed Maria by hitting the highest note ever in her solo Climb Every Mountain) It’s a gem, but back to gardening..
NITROGEN: Food for your soil microbe friends may include green leafy garden refuse, grass clippings and weeds plus kitchen scraps ( minus dairy or processed food items) added to your compost pile. Also, leave no earth bare in the garden, cover crops are defined as a crop grown for the protection and enrichment of the soil, plant cover crops! They pull nitrogen down to your soil food web pals. Some suggestions include legumes, clover, buckwheat. CARBON: The ultimate good stuff you want to store in the ground and in your compost pile in maintaining an optimal dining experience for your underground consumers. Collect and use brown leaves, twiggy garden debris, untainted straw or hay by sandwiching between layers of nitrogen rich decomposing greens mentioned above. ORGANIC MATTER: Humus, it’s what your compost produces over time and is to composting what that ribbon of ricotta is to Lasagna. Must, must have it! A shovel full of last years compost preferably over your brown (carbon) layer inoculates the pile with a diverse group of hungry critters and keeps microbial activity ramped up. If your just starting out, a spade full of garden soil or commercial (organic recommended) mulch will work fine. More good stuff on Lasagna gardening. Keep honing your skills in soil knowledge and put into practice good soil stewardship and I promise you’ll be playing to a packed house of tilth building fans that’ll lift you to rock star status in the garden. Need a little more inspiration? In her book The Soil Will Save Us, Kristin Ohlson, journalist and best selling author, passionately points to the ancient partnership between plants and soil microorganisms. 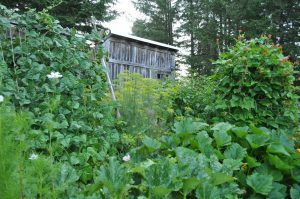 Nurturing soil health in agriculture and our own backyard gardens flexes your gardening muscles towards a long and meaningful garden relationship. I believe nothing teaches this as poignantly as composting. Dig into it and even if you’re not sure of what you are doing, don’t worry, dirt happens! Read more good stuff on composting in this post I wrote in 2007. The following excerpt by Kristen defines the stunning moment she became aware of the importance of the life in the soil. The soil.. It’s a very good place to start. When we stand on the surface of the Earth, we’re atop of a vast underground kingdom of microorganisms without which life as we know it would not exist. This entry was posted in Garden Stuff and tagged composting, garden, Kristin Ohlson, Sound of Music, spring, The Soil Will Save Us. Loved singing reminds me to keep moving forward. Awesome read on composting!